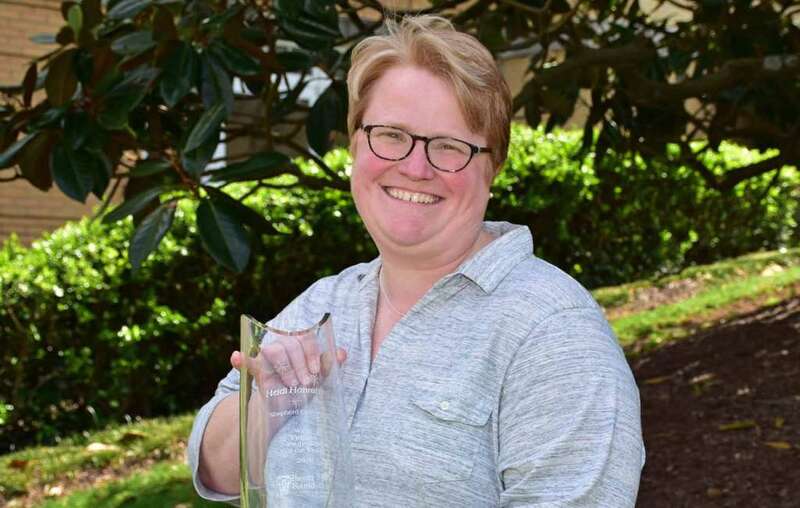 Congratulations to Dr. Heidi Hanrahan, who was named 2018 Professor of the Year by the Faculty Merit Foundation of West Virginia. In addition to serving as a professor in Shepherd University’s Department of English and Modern Languages, Heidi also serves on the Foundation’s board of directors as a representative pf the president. Heidi was nominated by the university based on her achievements in teaching and her involvement on campus and in the community. The award was presented on April 9 during a banquet held in the Great Hall of the Culture Center in Charleston. In addition to teaching English and literature classes, Heidi serves as advisor to Sigma Tau Delta English Honor Society, works with students on capstone projects, and helps them present at conferences and publish their work. She also works during summer advising and registration sessions. Heidi has taught many different courses and estimates she has touched the lives of at least 1,500 students since she started teaching at Shepherd in 2007. Heidi has also helped organize events such as a poetry festival involving high school students and a panel discussion to commemorate Frankenstein at age 200. She has appeared on local radio talk shows discussing Walt Whitman and Emily Dickinson and worked with her colleague, Dr. Carrie Messenger, associate professor of English, to organize a Jane Austen tea party. “Shepherd University is extremely proud of Dr. Hanrahan and her commitment to excellence in training the next generation. We are most fortunate to have faculty who excel in teaching, and we are grateful that these efforts are recognized at the highest level in West Virginia,” said President Mary J.C. Hendrix. The Faculty Merit Foundation was created in 1984 to provide a means to recognize and reward innovation and creativity among the faculties of West Virginia’s public and private colleges and universities. Through the Professor of the Year program, the outstanding achievements of those individuals are brought to the attention of the general public. A $10,000 cash award is given to the candidate selected as Professor of the Year, with smaller awards to the other finalists. The Professor of the Year award is sponsored by United Bank; Bowles Rice LLP; Greene, Ketchum, Farrell, Bailey & Tweel LLP; Maier Foundation; Graystone Consulting; and The Daywood Foundation, Inc.